--William Cullen Bryant (1794-1878) American poet and journalist. Let's hope our melancholy days are over! I'm ready for spring. But as I was looking though old photos I found this one of a moss/lichen covered tree on Unaka Mountain and thought I better post it before spring arrives. 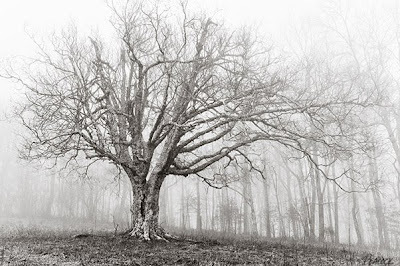 It's a sad and lonely photo, but there's something compelling about that tree, its rough textures and graceful curves reaching out into the mist. I love this picture! I would buy it if you are selling!! (I have a tree theme going on in one room and looking for some more pics). Definitely my favorite shot of "the tree" so far. Love it. I love this picture! I've told you about my thing for misty mountains... not much of that here in Ohio. I finally had a chance to order it! Very excited! Thanks!